Something magical happened in the past couple of months in our home. H is now reading full, complicated sentences. While she’s been reading since she was four, her skills were a bit jerky and definitely still in the preschool stages. But recently, it’s like the floodgates opened. This reading explosion, I should mention, coincided with our use of Reading Kingdom, an online program designed for kids in the K-3 levels. Its goal is to help create successful readers who can go beyond phonics or sounding out letters when they read. Consider these: heat, hearth, caveat. They all look alike on paper, but they are pronounced differently. According to the Reading Kingdom website, fewer than 1 in 5 words can be sounded out. Reading Kingdom solves this situation by not solely relying on phonetics. Instead, it makes use of a six-prong method. In Dr. Marion Blank’s patented method, she uses sequencing, writing, sounds, meaning, grammar, and comprehension. In Reading Kingdom, each of these levels is taught through several lessons. The recommended frequency is to use the program four to five times each week, completing one to two sessions in each sitting. We were at the tail end of our school year when we started to use Reading Kingdom. We mainly used it as practice after our regular lessons. Once summer started, I made H sit down and do a round or two to keep her from getting rusty. Admittedly, we were not able to comply with the recommended frequency, because we’ve gone on a few long trips as a family. We did an assessment at the beginning of the program, which allows Reading Kingdom to determine the level your child will be in. Since H was a preschooler, we were placed on the lowest one. Each session has a series of questions that often involves repetition of the word. The words are presented in different ways, such as spotting it in a sentence or typing out the missing letters. The next lesson then builds up on what the child has previously learned. Notably, Reading Kingdom reminds you after each session that it works best when you only do two at the maximum to get the most benefits. One thing that I liked about Reading Kingdom is that it did not use the typical words associated with young learners. We did not have to read “dog” or “mat” even at the earliest stages. Reading Kingdom also took steps to put the words in context. There would be questions that asked the child to pick the picture that corresponds with the word. I observed that comprehension and usage of words is given weight, even in the beginning. 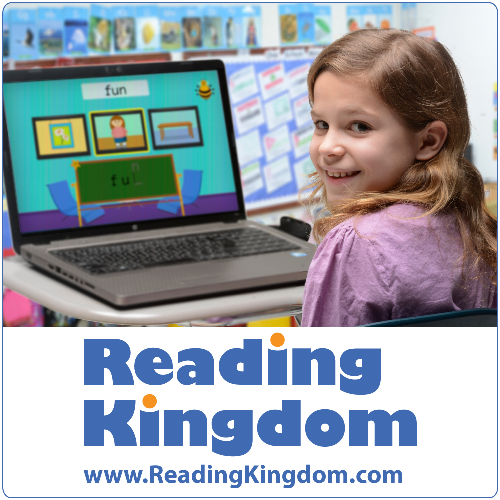 Reading Kingdom is an online interactive program that requires the use of a physical keyboard. H has had a chance to use the keyboard, thanks to a previous product we reviewed. It was an advantage for her because she was a little familiar with the letter placements. For kids who are not used to the keyboard, Reading Kingdom does offer prompts to help them locate the letters. H enjoyed the program because of its cute graphics and friendly-sounding narration. However, I had to coax her into sitting through the lessons because most of the questions were repetitive. From an educator’s standpoint, repetition makes sense because it ensures mastery. From the perspective of a then-five-year old, it was just another reason to be antsy. H is now faster and better at reading. Do I credit Reading Kingdom for this? Not solely, of course. Nothing beats mom sitting down with her, teaching her how to read and helping her choose a book. But, it is a great supplement and practice tool. Reading Kingdom is engaging and you can really see the methodology in the way they build up a child’s reading skills. It is also a great way to introduce the use of technology, like how to use the mouse and the keyboard, to young kids. The company also offers ASD Reading, which is a patented, research-based reading program for children with Autism Spectrum Disorder. Read more reviews on Reading Kingdom and ASD Reading by clicking the image below.